Stylus Pens There are 23 products. Looking for cheap stylus promotional pen for next give away on large scale? Spark Stylus could be pen for you. Simple and affordable all white or all black plastic twist pen with rubber stylus nib on the top. It has a black refill with 500 metres of writing ink and a tungsten carbide ball for improved writing quality. Twist action plastic ball pen with a white barrel and a stylus for use with touch screens. It has a Black ink refill with 500 metres of writing ink and a tungsten carbide ball for improved writing quality. Twist action plastic ball pen which features a metallic barrel, metallic Silver trim and a stylus for use with touch screens. It has a Black ink refill with 500 metres of writing ink and a tungsten carbide ball for improved writing quality. Trendy curved contour, high quality white ABS plastic barrel, translucent soft touch rubber lacquered grip and stylus nib for smart devices makes this pen winner for your next promotion. 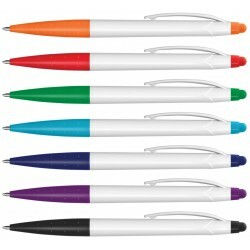 It featured chrome trims , grip and matching colour stylus that comes in ten assorted colours to match your company logo. Retractable plastic ball pen with a metallic silver barrel, metallic trim and a stylus for use with touch screens. It has a unique spring loaded phone holder located in the retractable mechanism which will securely hold a phone and angle it upwards for easy hands free viewing. Astra has a black refill with 500 metres of writing ink. Uniquely shaped multifunctional pen that won’t disappoint and will make sure for your brand to stand out. It has stylus nib at the tip of the pen and soft textured rubber grip. Colour of highlighter matches colour of the cap except red cap which has pink highlighter.